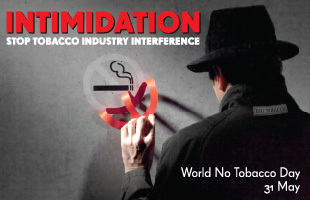 The World Health Organization (WHO) selects "tobacco industry interference" as the theme of the next World No Tobacco Day, which will take place on Thursday, 31 May 2012. The campaign will focus on the need to expose and counter the tobacco industry's brazen and increasingly aggressive attempts to undermine the WHO Framework Convention on Tobacco Control (WHO FCTC) because of the serious danger they pose to public health. As more and more countries move to fully meet their obligations under the WHO FCTC, the tobacco industry's efforts to undermine the treaty are becoming more and more energetic.